A seminar entitled “Smart Church: Youth initiatives for an efficient, vibrant, communicating Church” was held on February 17, 2015 at Azariah House at National Council of Churches in India (NCCI) campus in Nagpur. It was jointly organized by NCCI’s Commission on Communications & Relations and the Commission on Youth. The purpose of this seminar was to provide space for young people from our Churches to come together bringing their own experiences and ideas towards enhancing the ministries of the Church, especially in their organizational aspects, and particularly in terms of consolidating the communication systems, tools and processes. The program was attended by 28 participants from several protestant denominations as well as Roman Catholic orders. Praise songs at the beginning of the program was led by Ms. Mrinalini Pakhare, Ms. Rebecca Hembrom and Mr. Reuben David. Opening prayer was done by Pastor Zuchon. Rev. Caesar David, Executive Secretary of the Commission on Communications and Relations, outlined the scope of the program and welcomed everyone. The resource persons were felicitated, there was a round of introductions. In her keynote address Ms. Preety Kamble, President of Youth Synodical Youth Fellowship Committee of Church of North India, said that a Smart Church is a growing church with strong faith, helping the communities to come together for better administration and networking. In her interactive address, she questioned the participants about their idea of a Smart Church. She quoted Rick Warren from the book Purpose driven church: The church is a living organism, it is natural for it to grow, if it is healthy. If a church is not growing, it is dying. She closed with a personal challenge: How would you and I make our church a smart and growing Church? Prof. Dr. Kalpana Jadhav, Youth trainer and executive member of Maharashtra Council of Churches (MCC) started her session with the game “Chinese whispers” to demonstrate and observe the distortion of information that the process of communication must take seriously. In her presentation she explained the various elements in the process of communication with special emphasis on points that the Church can use towards more efficient working. She also said that, one should find one’s own voice and execute it appropriately with Christian values, and that for the Church to be smart, its youth have to be smart and adept at linking the benefits of technological advances to the work of the Church. Rev. Sunil Raj Philip, Executive Secretary of the Commission on Dalits, spoke about the Opportunities and Pitfalls of smart communications. He spoke on the intra-personal and inter-personal forms of communication. He spoke about the emerging New Media where people can vent out their feelings when they are not heard in the Church. The two-way communication that is characteristic of new forms of communication must be used by Churches to break out of some set patterns and structures that have been limiting and hindering the efficiency of the Church. He also cautioned about how the overuse of gadgets can sometimes lead to underuse of information thereby resulting in barriers between people. After lunch, the participants were broken into 4 groups and questions to think about, discuss and bring their findings to the plenary. The discussions were very lively and engaging, and as such, clearly brought out youth ideas, aspirations and hopes towards initiating the move towards greater efficiency in Churches. 1. What is a “Smart Church"? In order to overcome the barriers to becoming a Smart Church, participants felt that Sharing information, education and media literacy, networking, cross-learnings, mutual encouragement and help, are some of the main elements that need attention and action. The program ended on a note of promise as enlightened youth were found to have been inspired to continue explorations at their local and regional levels, spread the idea in their networks and seek out opportunities to put into practice the ideas shared and learned at this seminar towards being an efficient, vibrant, communicating Church and thereby an effective, relevant and a “Smart Church”. The National Council of Churches in India calls upon all its constituent members along with the Member Churches and other non-member churches to unite in prayer for the misguided terrorists who are involved in extreme Islamic goals of mass conversion or death not even sparing the little children. The NCCI pleads with all those who read this mail to forward it to your churches to pray unitedly in your intercessory prayers. May this Lenten Season bring light upon those who are misguided in the name of religion. Lord, we come before you in sadness and grief for the people facing persecution in Your Holy name. Your Son Jesus Christ suffered and died for us. In His resurrection He restores life and peace in all creation. Comfort them Lord, we pray, all victims of intolerance and those oppressed by their fellow humans. Remember in your kingdom those who have died. Lead the mis-guided terrorists towards compassion and give hope to the suffering. 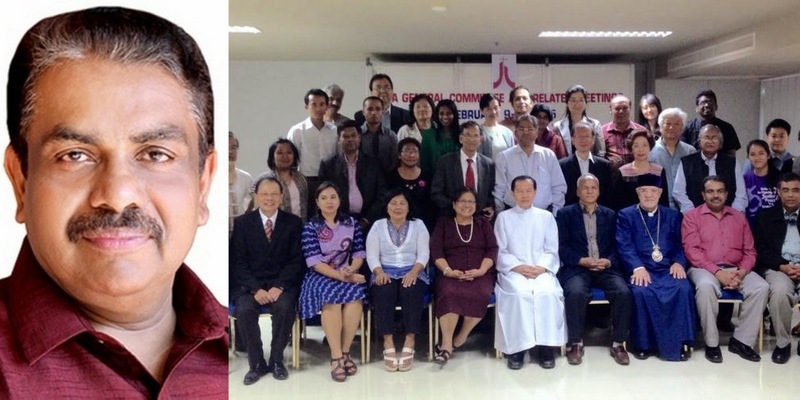 Dr. Mathews George Chunakara, a lay member of the Mar Thoma Syrian Church in India has been elected unanimously as the new General Secretary of the Christian Conference of Asia (CCA) for a term of five years by the General Committee of the CCA which met at the Assumption University, Bangkok, Thailand from 10-12 February 2015. Mathews George Chunakara is the first Indian citizen to be elected to this position. He will succeed Rev. Dr. Henriette Hutabarat Lebang from Indonesia, who was elected General Secretary in 2010. Dr. Mathews George Chunakara comes with rich ecumenical experiences in Asia and at the global level. He held various positions in his own country in India, Asia region and at the global level during the past thirty years. He was Director of the Commission of Churches on International Affairs (CCIA) of the World Council of Churches (WCC) in Geneva, Switzerland from 2009 to 2014. Prior to that, he served as Asia Secretary of the WCC (2000- 2009) and Executive Secretary for International Affairs of the CCA in Hong Kong (1993- 2000). Christian communities are now more frequently targeted for violence. In Delhi, in less than two months five Church buildings have been vandalized or burnt down. The police have not solved most of the cases and it has created a sense of fear among the Christian Community in India. The Christian community had peaceful protest in front of Sacred Heart Cathedral on 5th February, 2015 against Government inaction on Church attacks. However, Protesters were dealt very roughly by the Delhi police. Many of the priests, lay men and women, were dragged into police van and detained at the Parliament street police station. Around 500 protesters were taken to the Police station. The police was not even allowing them to protest inside the Church and not allowing protesters to meet the media. Later, the Christian leaders met the Union Home Minister Mr. Rajnath Singh and demanded that the Government take urgent and effective measures to restore the Rule of Law, curb the acts of targeted and communal violence. The guilty must be traced, and action under the law should be taken. Police officers must be held accountable for communal crimes in their jurisdiction. 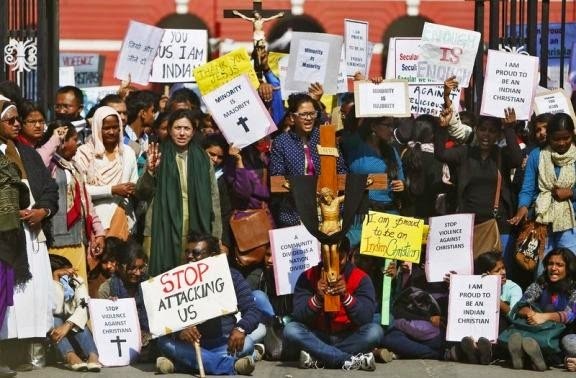 In Delhi, a special investigating team should be set up to investigate the five acts of violence against the Catholic Churches monitored by the High Court of Delhi. The Home Minister assured that he would not tolerate any discrimination. He promised an independent investigation into the Church attacks and he has asked the police to ensure the security of Churches and other places of worship. News from Chhattisgarh: Please find here below the People's Manifesto on rebuilding Chhattisgarh prepared and presented by the Chhattisgarh Unity Convention of Secular - Democratic - Progressive forces. BELOW IS THE DOCUMENT IN ENGLISH. FOR HINDI CLICK HERE. We express our deep concern that, for the first time in the electoral history of India, the religious fundamentalist forces (with a declared historical agenda for “Hindu Rashtra”) trying to gain political control over the State, thus, posing grave threats to the very core and content of the Constitution of India.